London Euston Station is currently the UK’s fifth busiest railway stations and one of London’s many railway terminals. It is the southern terminus of the West Coast Main Line which serves Birmingham, Manchester, Liverpool, Glasgow and Edinburgh. 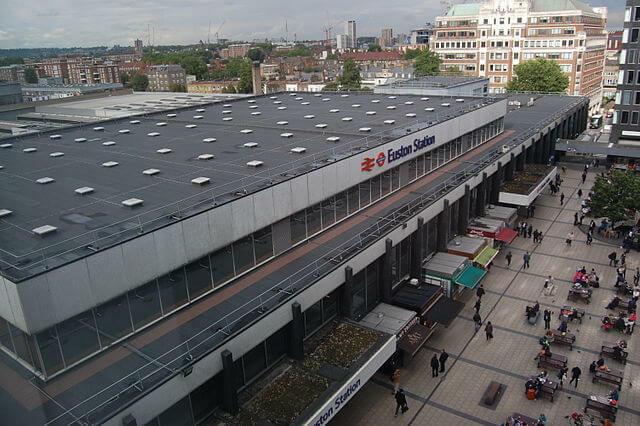 Below you’ll find key information about Euston station including tickets, train times, departures, shops, restaurants, pubs and station facilities. You can buy your tickets to and from London Euston online, or at the station from either ticket machines or the manned ticket office. There are currently 4 train operating companies that use the station. These are some of the major destinations served. Toilets: Yes, located by the entrance to platforms 1-3. Tourist Information Office: Yes, located on the main concourse. ATM Machine: Yes, outside the station, on main concourse and outside main entrance. Bicycle parking: Yes including sheltered storage. Car Park / Parking: Yes, underneath the station, access is from Melton Street. Taxi rank: Yes, located beneath the station. Euston once boasted two hotels: the Euston Hotel and the Victoria Hotel. However, these have long closed. If you’re looking for a nearby hotel please have a look at our guide: Top 20 Best Hotels Near London Euston Station. Euston Tap: Located in Gatehouse in front of station at 190 Euston Rd. Location for Rail Replacement Services: Go to Platform 2, there is a gate adjacent to the station from the main road. 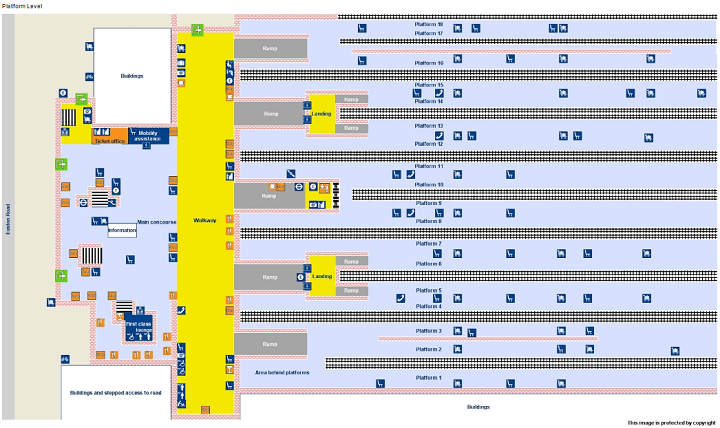 Euston Station platforms: Normally platform 9, although occasionally platforms 8, 10 and 11. Please also see our guide to Hotels near Euston Station. * Note prices accurate as of publication, but are subject to change without notice.